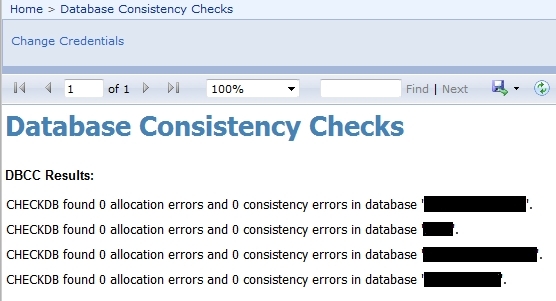 The following shows how you can automate the process of Database Consistency Checks (DBCC) for your MS SQL servers. This produces an email daily, weekly or monthly depending on how frequent you would like the checks to run and contains a link to a SQL Server Reporting Services report which displays a summary of the DBCC results. I successfully deployed this in a SQL 2012 environment but it should also work fine in a SQL 2008 R2 environment too. The following scenario will utilize DBCC to scan and report on the databases Accounts_DB and HR_DB. The first step is to create a new Database on the SQL server to store the DBCC results. This concludes the work needed to be done on the SQL server, now to the SSRS report – I’ve also attached a sample report to the end of this post that you should be able to reconfigure for your own use. You should now have an automated way to ensure the integrity of your databases and to notify you of any errors that may occur. Download the sample SSRS .rdl report by clicking here – it should work in your environment with just a few tweaks to the DataSource/DataSets.